...but totally smitten am I with my new skirt! Yet another variation of my trusty McCall's 5081 pencil skirt pattern, this baby was whipped up in just a couple of hours after I was practically smacked in the face by a flash of inspiration and an uncontrollable desire to own a fishtail frill wiggle skirt made from this sickeningly fabulous printed nylon I picked up in Walthamstow. Construction wise, I shaved a couple of inches off each side to create a more closely fitted, wigglier silhouette and omitted the tail pleat (??) so that adding the gathered frill would be neater. The frill itself is simply a long length (almost 2m) folded over and gathered at the top where the raw edges meet. With hindsight, I probably should have gathered the frill using elastic then sewed it to the hem with a zigzag stitch so as to allow for a bit of stretch... As it is now, there is no give whatsoever in the hem and one does have to significantly reduce ones stride almost to a pigeon step, resulting in a slightly exaggerated bottom wiggle of a walk. I guess that's why they call it a wiggle skirt. For some reason, the print and texture of this fabric reminds me of Carl Douglas' Kung Fu Fighting... Which I've now had stuck in my head for three days. Bloody Nora that skirt made my jaw drop! That is simply stunning Elisalex. Stunning. 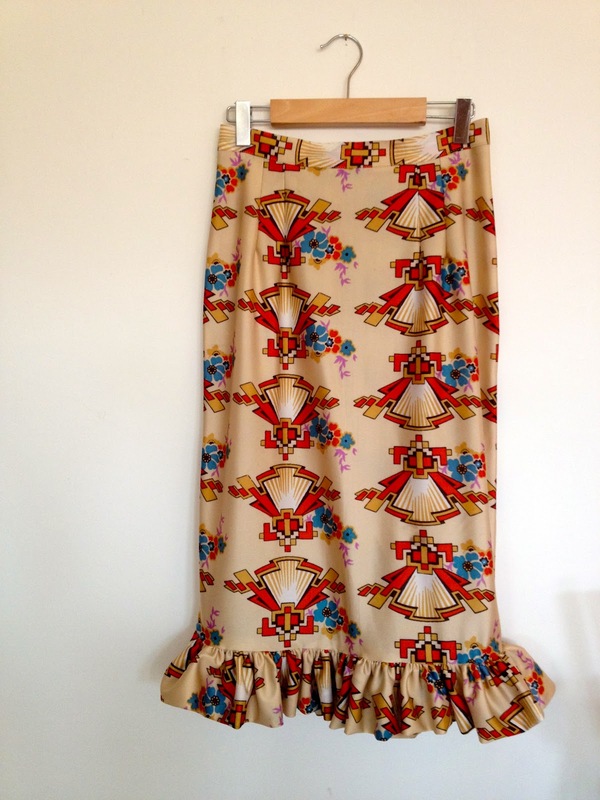 The fabric is bonkers but in the best possible way and the frill... words fail me. Just sublime. This is absolutely divine on you, I seriously love it! This is SO GOOD. Amazing print. Great job with the fit of this skirt. It suits you very well! I would never have thought to use a fabric for a skirt like you've made, but it works very nicely! So very, very cute. Love the fabric and the ruffle was a nice touch. You look great! It is georgeos! Love it! Seriously stunning! Love the ruffle, I've been wanting to try doing one myself, I'll have to give it a go now - great tip about using elastic. This looks amazing on you girl! Love the ruffle and funky fabric! I love it? How do you keep your belt neatly over the skirt with out belt loops? I have a zillion belts,I belt everything, but I find i'm adjusting them all day. Cinch that belt tight!!! I often find myself adjusting belts too but I so much prefer the clean look of a belt without loops, so I'm ok with a bit of adjusting! Toot away! This look is heaven. Really gorgeous fabric and fit. hahahaha that's awesome fabric, and you've found the perfect pattern match for it. Love the ruffle at the hem. I'm not a great fan of pencil skirts but I love the look of one with a ruffle, I'd happily wear that and the pattern works so well with it. Its a great art deco print, Walthamstow sure throws up some curious fabrics! This skirt looks really great on you. Isn't it funny how Pinterest just keeps posts from blogs going around and around, after years?! You don't even keep up this blog anymore, it looks like. Oh, well... I still wanted to tell you it's an amazing skirt! I love hearing your thoughts, and if you have any questions at all, I will reply to them within these comments - so please be sure to check back to get your answer! OWOP - Count me in! All patterns and recipes on this blog are my own design, so please do not sell products made from my patterns or recipes, or publish any content from this blog elsewhere without my permission. Thank you. © 2011-2012 Elisalex de Castro Peake. All rights reserved.